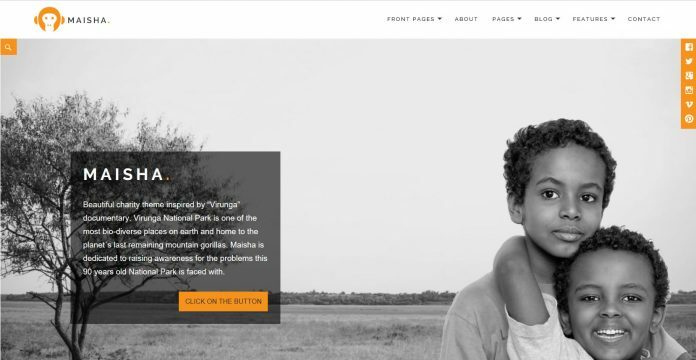 Maisha is a beautiful & powerful charity WordPress theme inspired by “Virunga” documentary. Maisha is a Charity WordPress Theme by Anariel Design that allows charities to highlight their various initiatives and programs as well as collect donations directly from the website. Maisha is powered by Give, powerful free WordPress plugin that allows for Donation and Fundraising. Design of the theme utilizes black and white images with minimal color in the user interface (UI) to convey a somber and serious tone befitting the subject. And thumbnails on the homepage features a CSS filter to automatically change the color to black and white. Colors can be changed using the native WordPress Customizer and you can personalize the site even more by changing the fonts with Easy Google Fonts, a free WordPress plugin for adding Google Web fonts onto your WordPress site. A full pro version of Soliloquy Slider is included with this theme for creating beautiful and responsive sliders. If you are more visually inclined when composing pages, you will be happy to know that Maisha plays well with popular WordPress free, popular page builders such as SiteOrigin Page Builder, and Beaver Builder. Maisha is more than a charity WordPress theme, it can in fact, be suitable for a variety of uses. Anariel Design has provided some design ideas using this theme. Maisha is design integrated with loads of plugins for extending functionality. Give – Accepting donations on WordPress with Give. The Events Calendar – Plugin that lets you easily create and share your events. Maisha retails from $59 – $199 as part of a bundle that gives you access to all themes from Anariel Design. Anariel Design currently has 21 well made niche themes in its collection.